Sometimes I admit to taking for granted the beauty in my backyard. 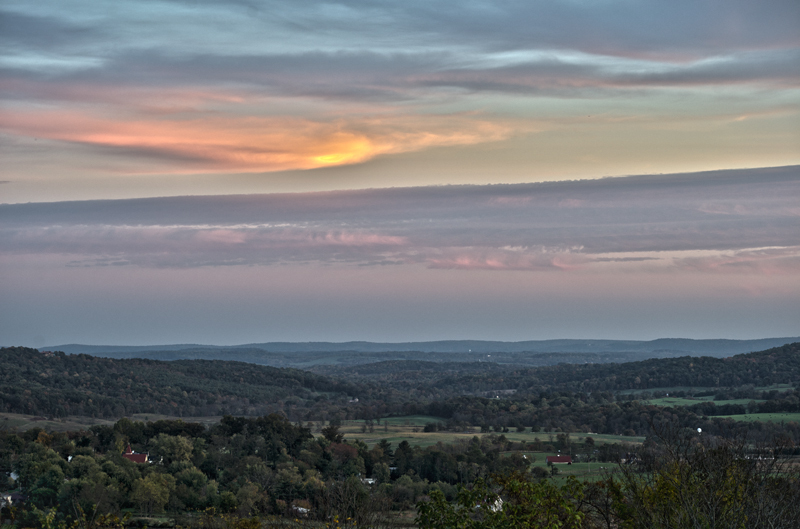 But tonight, on the way home from Middleburg, Virginia, I made a point to stop at top of the hill at Ashby Gap to take a few photos of the sunset reflecting over the small town of Paris and the Crooked Run Valley. We drive up and down the mountain several times each day, and I always admire the vista and how the valley changes through the different seasons, but I always say to myself, “Oh, I’ll just stop another day.” Well, I’ve decided that I’m not going to think that way anymore. I’m going to resume the habit of carrying a camera with me on a daily basis, and if I see a beautiful moment on my journey I’ll stop and enjoy it. If I’m a few minutes later getting to my destination, it will be well worth it. Thank you for this photo. This is my favorite place. My favorite Paris.